Materials from the Mark Samuels Lasner Collection. Photo: University of Delaware Library. Mark Samuels Lasner has long been recognized as an authority on the literature and art of the late Victorian era. He is also a collector, bibliographer, typographer, and Senior Research Fellow at the University of Delaware Library. To those offices he can now add the honorific of benefactor. 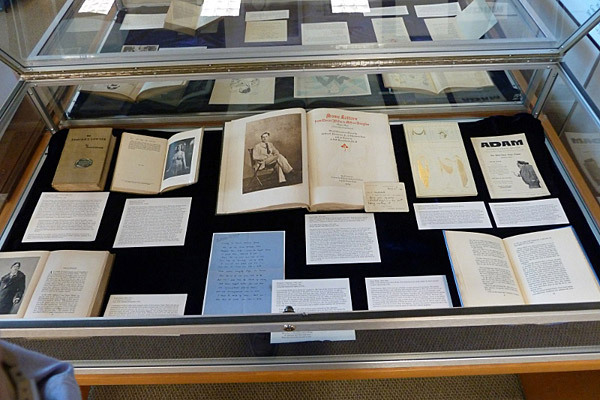 For recently Mark donated his private library, the extensive Mark Samuels Lasner Collection, to the University of Delaware. It has been housed since 2004 in the Morris Library, and now becomes largest and most important gift of its kind in the university’s history. Oscar Wilde, essential figure of the fin de siècle though he was, joked with Robert Ross that he would not outlive it. Oscar, who was usually right about everything, wasn’t far wrong: he died in November 1900. He left behind friends who were to belong to a new movement, an artistic circle I might call the début du siècle, who inherited a world of change that was soon to become a world at war.